The Speech-Language Pathologists (SLPs) at Topeka Ear, Nose & Throat provide care to patients with voice, airway and swallowing disorders, which include disorders of the vocal cords, larynx, upper airway and upper digestive tract. In addition to diagnostic services, they provide non-surgical rehabilitation services to help restore function and improve quality of life. Our SLPs understand the fears and frustrations that can accompany any type of voice disorder and are committed to helping patients communicate more clearly, easily and effectively. 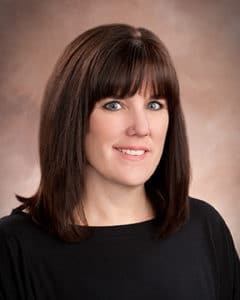 Erin Kirkland received her undergraduate degree in communication sciences and disorders and her master’s degree in speech-language pathology from Kansas State University. Her clinical interest is in voice disorders; the reason for this and why she became a speech-language pathologist is because of her own difficulty communicating as a child. Erin is a member of the Kansas Speech-Language-Hearing Association as well as the American Speech-Language-Hearing Association. In her spare time, Erin enjoys hiking, canoeing, gardening and reading as well as spending time with her granddaughters. 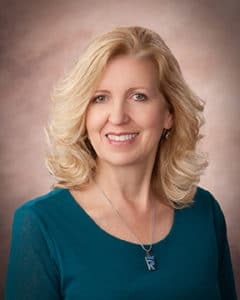 Sheri Becker earned her bachelor’s degree in speech, language and hearing sciences and disorders and her master’s degree in speech-language pathology from the University of Kansas. She specializes in adult and pediatric voice, pediatric resonance disorders and fluency. Sheri chose to be a speech-language pathologist because she can work with patients of all ages and give the gift of helping others communicate. She is a member of the American Speech-Language-Hearing Association and the Kansas Speech-Language-Hearing Association. In her spare time, Sheri enjoys watching her children play sports, hanging out at the lake and relaxing at backyard barbecues with friends and family. 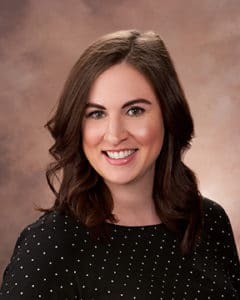 Molly Rana earned both her undergraduate degree in speech, language, and hearing sciences and disorders and her master’s degree in speech-language pathology at the University of Kansas. Her clinical interests are in pediatric voice and speech sound disorders as well as adult voice disorders. Molly chose to become a speech-language pathologist because she enjoys working with people, especially children, to explore their communicative potential and find their voice. She is a member of the American Speech-Language-Hearing Association as well as the Kansas Speech-Language-Hearing Association. In her spare time, Molly enjoys reading, traveling, being with her family and spending time outdoors with her husband and their dog.